Do you have a toothache that is causing you problems near Ocala or The Villages? There are many reasons for a toothache, but really–when you have a toothache, the one thing you are interested in is how to get rid of it! Having a toothache can really make life difficult. Dr. Harper and his caring, well-trained team would like to offer you a solution that can eradicate that toothache and give you some relief. It is a root canal. 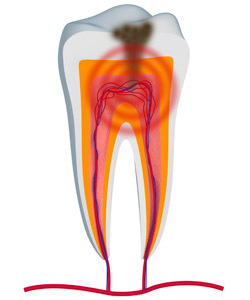 A root canal is a procedure that removes bacteria that has infected the root pulp in a tooth. Root pulp was necessary to help your growing teeth when you were younger, but once your adult teeth have all come in root pulp is no longer necessary and can become infected. When this happens, as you may assume, it creates a toothache, and needs a root canal to be treated. What is the root canals procedure? Though a toothache is often the indicator that a root canal is the needed treatment, this is not always the case. Dr. Wayne Harper will give you an examination and diagnose root canals if he sees an indication that they are required. Root canals are not the horrible procedure they have been in the past. In fact, your toothache is probably worse than the treatment that will make the toothache go away. Once Dr. Harper numbs your gums, he will remove the bacteria that has infected the root pulp. Then, he will place antibiotic medicine in the cavity that remains. Finally, he will seal the tooth, either with tooth-colored filling used when filling a cavity, or with a dental crown. As with all dental procedures, with root canals, we are happy to offer dental sedation that can make the root canals treatment anxiety-free as well less painful, as anxiety can also create more pain. There is no special treatment for your teeth after root canals except your regular brushing and flossing and seeing Dr. Harper for your regular check ups. If you are suffering from a toothache or think you may need a root canal or root canals for any reason, call us in Ocala today! We are ready to do all we can to give you your healthy, pain-free smile back to you and get you oral health in shape if you are in The Villages or Ocala area!